The standard Excel worksheet interface may be suitable for those who are familiar with Excel, supported perhaps with comments to guide the user. For example, Figure 10.15 illustrates how comments can add explanation to the meaning of a column of data in a spreadsheet. 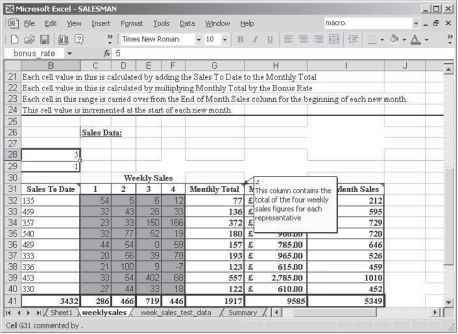 In the fragment shown of the weeklysales worksheet of the SALESMAN workbook, the comment elaborates on the meaning of the sales_to_date range. Clearly, the designer of this type of interface will not require much knowledge of VBA. A user with an intermediate knowledge of Excel might benefit from the use of a formatted workbook. That is a workbook using worksheets that have locked or protected cell ranges, or perhaps use different fonts or colours to distinguish parts of the system, and so on. Figure 10.15 shows how the SALESMAN workbook has been formatted to enhance usability. Notice how the Weekly Sales range of the weeklysales worksheet has been coloured grey to make it stand out. Also, notice that the totals row at the foot of the data entry area is heavily bordered to make it stand out. An intermediate user may also benefit from the use of application specific balloon Help. 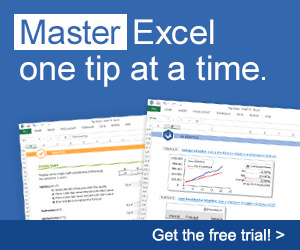 A complete Excel novice user might b e b est served by designing customised dialog boxes for data entry, or forms with other window controls as a front end, possibly rendering the worksheet invisible to the user. For example, in Figure 10.16, a dialog box is used to input data for adding a new representative into worksheet cells. The design of this system was looked at earlier in this chapter. For a novice user with no knowledge of spreadsheets this interface style would be better than using a raw worksheet to add the data.